Buahaha. Show brought on the CUTE today in episode 5. I might have busted a gut laughing, which is a nice reprieve from the crazy that was yesterday’s. Most importantly, we get moments between uncle and nephew, and the glue that ties them together: Tarntawan. My fondness for her is growing, especially when she gets cheeky. Cheeky heroine? Yes please. Tarntawan realizes one very important thing in order to move her situation forward: the livelihood of her nephew. She has been at Rai Phu Tupdao for awhile now, and Nong Phit’s growing fear and unhappiness at the farm is starting to wear on her. He’s her priority after all, and when Suriyen’s minions and wannabe girlfriend Kaekai keep reiterating that Suriyen is a GOOD person – you just have to squint and look real close – Tarntawan makes her decision. It follows a scene where Nong Phit runs into his uncle. The music changes immediately, putting us in Nong Phit’s shoes. It’s kinda ominous and scary, with Uncle Phu staring down at the kid and asking in a mean tone “DO YOU LIKE PLAYING WITH CARS?” Nong Phit scrambles away, but Uncle Phu presses on, “I’M JUST ASKING, WHY ARE YOU SO SCARED?” If I weren’t so scared, I’d be laughing. Nong Phit is terrified and runs away, and right into his uncle’s personal storage space in the barn. Suriyen bangs on the barn door to yell at his nephew to get out, it’s his personal space and no one is allowed in. Who doesn’t love this metaphor? Suriyen literally has his heart and childhood locked in a barn. But Nong Phit manages to sneak in! He holds on to the robot figure that is near and dear to Suriyen’s heart. Suriyen and Tarntawan got the barn door unlocked and Suriyen practically barks at them never to enter his domain again – he takes the robot and stomps away. Next we hear Suriyen playing a sad song on the piano and our cool lawyer relaying to Tarntawan that the robot was given to him by Suri and it’s his most cherished toy. He adds that Suriyen is pitiful. We then see a flashback of a birthday gift exchange between him and Suri when they were kids. It was the happiest moment of his life to be with a happy family – he eats and sleeps with the robot. 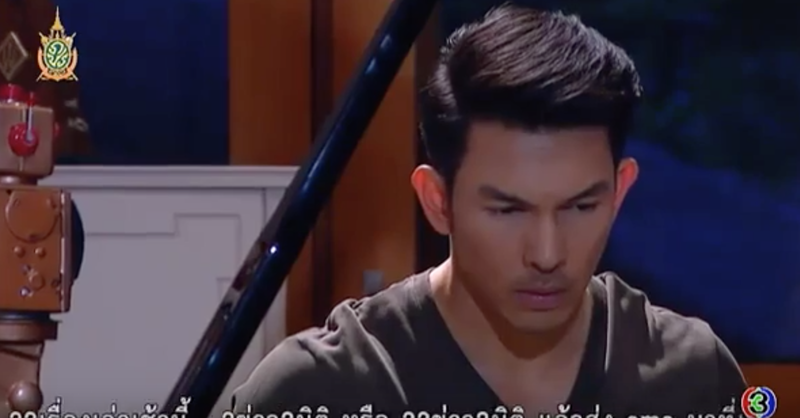 Tarntawan watches him play the piano with an intensity, as she starts to feel sorry for him. Which prompts her to reveal to the nanny that she’s going to help Suriyen win over Nong Phit. It’s been hard for her to watch her nephew afraid and sad, he deserves to be happy, and maybe he can be happy here after all. She just needs to make Suriyen fall for Nong Phit. WOOHOO! I kinda love our heroine right now. Team “Make Suriyen Human” is composed of Tarntawan, our good lawyer, and the household/bodyguards. Tarntawan is instructed to bring Nong Phit to Suriyen, but she disregards it, she says that she has to see his willingness to change himself in order to keep Nong Phit at the farm. Rule number one is that Suriyen must always smile in front of Nong Phit. She questions whether he knows how to smile, haha, and Suriyen says that of course he does, but not for her. Even our lawyer spreads his mouth into a smile to show our beast what it looks like. Haha. Rule number two is that he must speak in falsetto (a softer high pitch voice) in order to make Nong Phit feel comfortable around him. Queue lawyer start talking in falsetto and Tarntawan joining in. The lawyer says that the more Suriyen practices, he’ll get used to it. Suriyen stomps away looking embarrassed. Our lawyer follows and fully understands his boss’ predicament. He knows Suriyen doesn’t want to look silly and weak in front of his guards and household workers. Next thing we know, Suriyen sees all of his employees talking in falsetto! HAHAHA. This just cracks me up. He yells at them to stop this instant, but they just continue being the bane of his existence. In a falsetto voice, the lawyer says that he no longer has to be embarrassed because now they’re all talking like that. I’m dying over here from the bromance. When Suriyen sees Nong Phit next, the little boy calls him a monster. Haha. Tarntawan suggests that if Suriyen doesn’t want his nephew to keep calling him that, he ought to do what she has asked him. Suriyen looks uncomfortably away, but then cracks a smile at Nong Phit. OMG, that smile! Even Tarntawan couldn’t help but smile back. Nong Phit looks up at his uncle and he too flashes a quick smile in return. Tarntawan tells Suriyen that in order to make Nong Phit more comfortable at the house, HE needs to take Nong Phit on a tour – every nook and cranny – especially everything that belongs to Suriyen. Aw. I love this too much. So Suriyen gruffly and begrudgingly shows Nong Phit his room and the rest of his domain. He even tries to have Nong Phit sit next to him on the couch. But when Nong Phit wants his one precious toy –the robot – Suriyen snaps and kicks them out. Sigh, boys and their toys. Sometime later, he sees Tarntawan taking Nong Phit out of the house on the surveillance camera and thinks she’s trying to run away. He follows suit, but finds Nong Phit sitting alone, on a boulder. He takes Nong Phit by the shoulders and demands to know where his auntie is. Of course this makes the kid cry and Suriyen backs away like he’s been burned. He puts his hands up and says “I won’t bother you.. just go ahead and cry” haha. When Nong Phit continues to cry, Suriyen looks around desperately, and THEN he starts talking in a falsetto tone. “I’m not hurting you, I just want to ask where your auntie is.. Don’t be afraid of me. I swear, I won’t make you sad. I’ll take you out to play.” LOL. That got Nong Phit to quiet down, and Tarntawan jumps up from her hiding spot with a smile. He grasps her by the shoulders but she’s in too much of a good mood to let it damper her. And she teases him to no end! Haha. The look he gives her, oh my, it seems someone is starting to think differently about the smiling Tarntawan. Later when he looks at the monitor and she can’t stop smiling when thinking about his actions with Nong Phit, he gives us this curious look. Now on to the non-interesting part of this show – the secondary/tertiary bits. I mean, do we even care? I certainly don’t. Pen pretends to open a factory in Rai Phu Tupdao so that she could ask Khun Decha about Athit and Suriyen. Turns out, her sham gets discovered and she confesses to Decha that she just wants to save her friend and nephew. Decha mentions that he’s on nobody’s side, he thinks Visut can fend for himself so that’s why he mostly focuses on Suriyen. He also advises that if someone were to hide somebody – let’s say Athit – then he’ll most likely be in the house. Uh, ok. But this opportunity makes Tarwut (Kattawut) realize that Pen is working with Visut and they’re plotting something. He does some damage control by damaging Rai Plai Fa’s reputation which causes several clients to cancel their reservations at the farm. Decha warns Tarwut to not create anymore enemies, but Tarwut tells his dad to stay out of his business, because dad’s influence is irrelevant these days anyway. There’s something about the dad that doesn’t make me trust him. But he can’t reign in his crazy son. Another development with tertiary characters: Khun Kim nearly has a meltdown in the elevator when she overhears a mom hitting her daughter in public and forcing her to play violin against the child’s will. Kim meddles and lashes out at the mom for doing this since she doesn’t know that abuse can traumatize a child, she will have nightmares and live in fear. The undercover cop, who is now her driver, questions whether Khun Kim had been hurt in the past, did Suriyen do this to her? I think it might be one of her parents, since this scene had caused her to remember the past. She didn’t deny that it wasn’t Suriyen, so, there’s that too. Did she run away from the farm because of her dad or because of Suriyen? Anyway, I really needed the cute in this episode. I love how the small things really add up. It may feel like a small step, but it’s a victory nonetheless. I’m glad Tarntawan is looking out for Nong Phit’s best interest, in that he really should bond with his uncle, and then in turn she wants to make Uncle Phu fall in love with his nephew. Even our beast is starting to soften up, I love the way he’s looking at her now. Maybe instead of a prince, he’ll just be a mushy teddy bear? Such great moments here, and I hope to see more. I’ve been watching on the TV3 yTube channel (which is unsubbed and I don’t speak Thai) but I haven’t really had much problem following this plot: Uncle Suriyen yells at nephew, Nong Phit cries and Tarntawan saves the day. Its only the side plots that take a bit of finessing to understand. I did look up that sheep farm resort that they are filming at – it looks adorable! Right, the farms and scenery in this show are just breathtaking. Makes me want to go on a vacation. To a farm. Preferably Rai Phu Tupdao and meet the beast. Well, it’s just next door . . .
SOO glad Tarntawan went the route of helping Suriyen win over Nong Phit, it makes for such awesome moments. Totally on this train instead of the craziness of yesterday’s episode. I am having a ball watch Suriyen try to tame his inner beast instincts and become more humane. Loving the lawyer, employees/bodyguards. I really don’t care for any of the subplots at this point, I am just watching for our main duo and seeing how the beauty tames the beast. Hopefully show gives us more of these aww moments to work with! Thank you for the reacp, Fia! I love watching Suriyen struggle to be human. It’s strange that a grown man could function as the Big Boss but is childlike when it comes to warm interactions. He thinks he can keep Nong Phit at the farm with his gruff ways, but slowly has to learn to be open and kind in order to receive openness and receptiveness from his nephew. Should take his own advice and be good to people who are good to him. Ugh, can’t wait for more! I laughed so hard when Suriyen went high pitched. The kid looked so confused why he’s speaking that way. lol And it doesn’t even phase Tarntawan anymore when he’s being aggressive with her. I think she’s trying to show her nephew that she’s not scared so he shouldn’t be scared too – and laugh it off. Kudos for her. Suriyen is such a big baby stomping away with his beloved robot toy. That got me laughing. Such a silly beast. I’m liking that things are finally changing around the farm. Btw, I love that first photo of them. Don’t they look like a real family? It shows off their personality perfectly. Me too, I hope the tone changes into taming the beast and we get more of uncle-nephew moments, because there’s more work to be done there. We’ve seen enough of the beastly side of Suriyen, let’s see what else he’s capable of, and how/why we should fall for him too. I’m not sure which exact scene you’re referring to, can you post the url with the mins/secs and I’ll translate it for ya? Lovefia, you’re the best! Thank you very much!! Through your post I understand what happened in every episode! I’m a fan of this lakorn even though I could barely speak Thai😂😊😊😁 Hope you will continue to do the review of this lakorn! You’re welcome! I do plan on continuing with reviews, even if occasionally I may be a little late. Thanks for your patience- I’ll try as fast as I can – but these old fingers can’t type fast enough sometimes! Oh!!! Thank u so much 🙂 can’t wait for the next episode patiently waiting…….